Step 1. Starting about 2 inches from the end of the sari ribbon, press it firmly on the bangle. Begin wrapping the longest end of the ribbon. Step 2. Continue to wrap around the bracelet until the bangle is completely covered. Step 3. Tie the two loose ends in a knot. Trim the excess ribbon. Step 4. String the accent bead onto the headpin. Step 5. Hold the accent bead close to the bangle and begin wrapping the wire around the bangle. With pliers push the end of the wire close the bangle. These are beautiful! Love the mix of colors and textures ... they look fabulous together! I've never looked quite right in bangles—the hard, sharp shape, I think—but I think these might be just the thing! 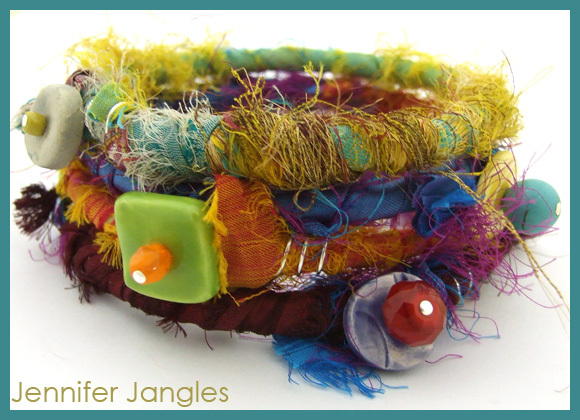 The sari ribbons soften them beautifully, and the touch of an interesting focal bead make for a perfect finish. Colorful and fun! So colorful!! So fun and so easy to do!! This is a fantastic project! 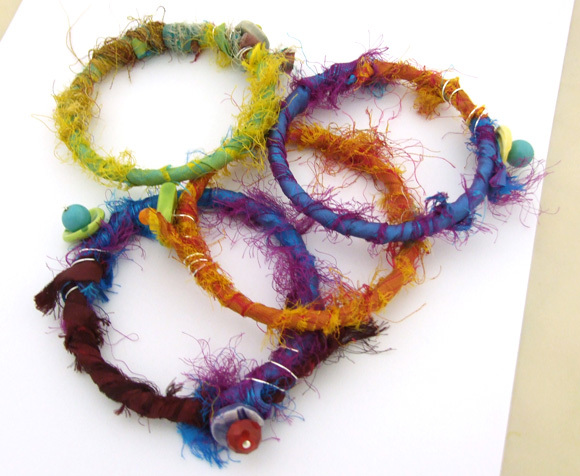 I love the colors you chose for these bracelets. Would you consider linking this up at my party? I hope you help me.